Been a bit busy lately as I’m currently in between competitions and been thinking about what direction I’d like to take this blog. As I’ve spoken with more people about BJJ, I’ve noticed that those most dedicated to learning BJJ, not simply for winning competitions or promoting, talk less about particular techniques and more about the inner workings of BJJ. These people also tend to have the chillest personalities, a stark contrast to how aggressive BJJ seems to be, especially noticeable in newcomers and white belts. In general, aggression is taken as an inseparable part of BJJ. I think part of what causes this aggression is how we’re taught BJJ. We learn the positions – mount, guard, side control, etc. – and the escapes and attacks from those positions. We drill each technique with a partner then learn how to bait and fine tune our timing during sparring sessions. The thing is, we roll how we drill. So if we drill just the positions, we roll focus only on the positions. Take, for instance, playing the guitar. While it takes work to memorize and cleanly play every chord, what marks a master guitarist is the way they transition from one chord to another. The same can be said with BJJ. For example, I’ve been focusing a lot on side control escapes lately. I’ve been reviewing old notes, watching videos, drilling extensively, etc. But what I’ve discovered is that even if I learn all the escapes in the world, I’m not addressing the real problem. The real problem isn’t escaping from side control – it’s the fact that I’m allowing myself to get trapped in side control in the first place. This is the problem with focusing only on individual positions. Because you learned a specific side control escape, you allow yourself to get trapped in side control so you can do the escape. But if you let yourself get into side control, you’re already in a losing position. And it’s this mindset that is a big source of aggression in BJJ. When we find ourselves trapped in an inferior position, it will always trigger that fight or flight response, oftentimes leading to the appearance our our inner Hulk. But BJJ isn’t about smashing. It’s about flow. Take this side control video by Daniel Faggella. Here, he talks about prevention, not allowing yourself to get into side control. He doesn’t say to disrespect or block the pass – he is instead redirecting his opponent’s energy and taking ownership of the transition. Note that it’s by understanding the position – for example, knowing that the top player wants both of the bottom player’s shoulders flat on the mat – that informs Faggella’s actions. We need to have intimate knowledge of each position, but we shouldn’t look at each position as separate from each other. Rolling in BJJ isn’t about hitting one position at a time, like a black and white checklist. Rolling is about yin-yang, flowing from black to white, spending a lot time in the in-between, moving back and forth seamlessly. 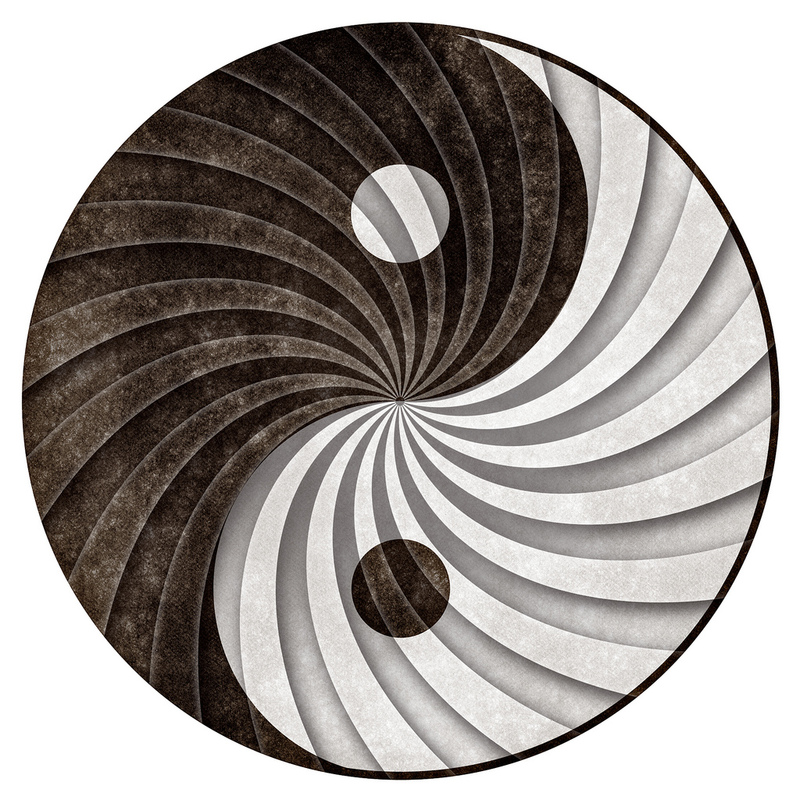 It’s this idea of flow that I’ve decided to focus on in this blog, to tie together BJJ and the concept of yin-yang, particularly the yin side. While activity – yang – is necessary in BJJ, it’s not necessarily aggression. And more importantly, it’s understanding that transition from yang to yin and back again that is key. Yin, the passive partner in the yin-yang relationship, is what seems to be the under appreciated side of BJJ. It’s what we do during yin, whether it be a passive moment during a roll or while resting from a BJJ session that is truly important.